Kathleen was diagnosed with polycystic ovaries when she was younger, which resulted in a 9lb ovarian cyst being removed via general surgery when she was 30, followed by additional keyhole surgery to remove scar tissue that caused complications from the previous operation. 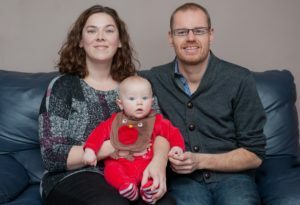 Undeterred, she and her partner Paul agreed that they would try IVF for a chance of having a baby when they were unsuccessful in getting pregnant naturally. The couple met when Kathleen was 25; they both wanted children, but with job changes, moving locations and health concerns the pair had to wait until the right time. After the surgery, the couple tried for several more years before seeking help. Looking at Kathleen’s medical history, her age and knowing her sister had similar difficulties in getting pregnant due to PCOS, the couple were referred by their GP to St Albans hospital for tests. After tests, which confirmed Kathleen had one blocked fallopian tube and cysts on her ovaries, the couple were recommended NHS-funded IVF. Kathleen, now 39, was just below the age limit. “Of the three clinics we were offered we chose Bourn Hall Clinic Cambridge as it was recommended by a friend and was in a convenient location,” says Kathleen. The couple attended a seminar in July 2014 and booked their first appointment. “The minute we walked through the door we knew we had made the right decision and we went in with a positive attitude and a ‘can do’ approach. 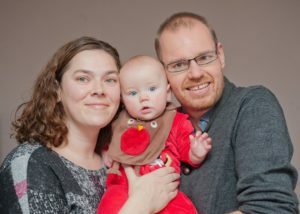 Just as they were starting their first NHS-funded IVF cycle Paul experienced a major health scare when blood vessels burst in his eye, affecting his vision. Paul was subsequently diagnosed with diabetes and high blood pressure. In preparation for IVF Kathleen had to self-administer the drug to stimulate her ovaries. Bourn Hall provides all patients with a drug teach session to help them feel confident in doing this. “I don’t like injections at the best of times so was daunted about doing it myself but I knew it was something that had to be done if we wanted to have a baby. “I was shown how to inject myself and allowed to practice on a ‘jelly belly’ beforehand. “Paul was really very supportive and sensitive and I told myself that if I did feel something – bad or good – it was because it was working. The day before her 40th birthday Kathleen took a pregnancy test, which was positive. Kathleen attended the Clinic to have her pregnancy confirmed and over the course of her pregnancy was monitored carefully to check everything was going well. On 24th May 2015 Harry was born. You can find more more stories about overcoming PCOS here. Find out about IVF treatments here.